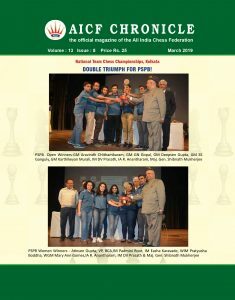 The All India Chess Federation is pleased to inform that the Government of India, Ministry of Youth Affairs & Sports has approved to sponsor the Indian Chess Team in Aeroflot Open Grandmaster Chess Tournament to be held at Moscow, Russia from 18-Feb-19 to 1-Mar-19 for 33 members (15 men + 14 women + 4 coaches) at full cost to Government. The Government of India is coming forward to empower chess players to reach their full potential. This step will ensure the players to participate in the best Grandmaster Open in the World.